Zion Market Research has published a new report titled “Specialty Food Ingredients Market By Type (Enzymes, Emulsifiers, Flavors, Colorants, Vitamins, Minerals, Antioxidants, and Preservatives) and By Application (Bakery & Confectionery, Beverages, Dairy & Frozen Foods, Convenience Foods, Meat Products, Functional Foods, and Dietary Supplements): Global Industry Perspective, Comprehensive Analysis and Forecast, 2017 – 2024”. 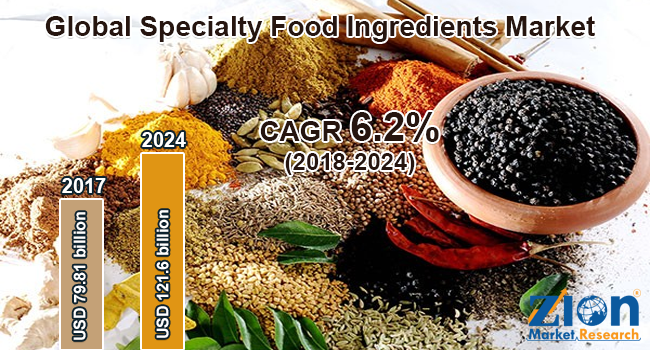 According to the report, the global specialty food ingredients market was valued at around USD 79.81 billion in 2017 and is expected to reach approximately USD 121.6 billion by 2024, growing at a CAGR of around 6.2% between 2018 and 2024. Specialty food ingredients are the ingredients typically used for texture, color, emulsify, and preserve food products. These ingredients improve the nutritional profile of the processed food. Specialty food ingredients provide necessary association facilitating entire amalgamation from the farm-gate level to the final value-added processed food stage. Specialty food ingredients offer technological and functional benefits which play an essential role in developing a wide range of safe, qualitative, tasty, healthy, and affordable food. Specialty food ingredients are either synthesized naturally or artificially. The global market for specialty food ingredients market is growing at a promising CAGR. The growth of the specialty food ingredients market is primarily due to the rising consumption of processed food and changing lifestyles across developing economies. Moreover, rapidly expanding end-use industries including bakery & confectionery, functional foods, and beverages is expected to fuel the growth of the specialty food ingredients in the coming years. Increasing awareness about health benefits of the specialty food ingredients, growing urbanization, and rising disposable income are the key factors projected to boost the demand for the specialty food ingredients within the forecast period. Based on product type, the market is classified into enzymes, emulsifiers, flavors, colorants, vitamins, minerals, antioxidants, and preservatives. Colorants and flavors are the fastest growing segments with high consumption rate. The softening, anti-staling, and digestive properties associated with enzymes are projected to boost the growth of the segment during the forecast period. Growing trend of incorporating antioxidants and vitamins in edible oils and other food supplements in order to enhance the nutritional value of food items is anticipated to fuel the growth of the segment over the forecast period. Based on the application, the market is segmented into bakery & confectionery, functional foods, beverages, convenience foods, meat products, dairy & frozen foods, and dietary supplements. Bakery & confectionery segment accounted for the significant market share. The beverage industry is the second important segment and is expected to grow at a significant CAGR over the forecast period. The growing trend of fortified, carbonated, and flavored beverages is expected to boost the demand for flavors and minerals in the beverage industry. The North America specialty food ingredients market accounted for the largest market share in terms of revenue in 2017. The market growth in the region is attributed to increased consumption of processed food in the U.S. and Canada. Asia Pacific is the second important market and is projected to grow at a considerable CAGR within the forecast period. The growth is mainly due to the increasing application of functional food ingredients in beverage production. Moreover, the increasing adoption of Western eating habits is anticipated to enhance the market growth in the near future. The specialty food ingredients market in Europe is projected to exhibit the highest growth over the forecast period with the high number of hotels and restaurants. In Latin America, the growing fast food industry is driving the growth of specialty food ingredients market. In the Middle East and Africa, the market for specialty food ingredients is anticipated to grow due to the increasing consumer spending on eating out. The companies are focusing on technological innovations and investment in R&D projects in order to launch new products in emerging markets. Some of the key players included in the global specialty food ingredients market are Archer Daniels Midland Company, Naturex, Tate & Lyle Plc, Frutarom, Prinova Group, LLC, Roquette Frères S.A, Ingredion Incorporated, Cargill Inc., Specialty Commodities Inc., AmTech Ingredients LLC, Sensient Technologies Corporation, Koninklijke DSM N.V., Ingredion, KF Specialty Ingredients, Woodland Foods Inc., Kerry Group Plc, PPG Industries, E. I. Dupont De Nemours and Company, Vidhi Specialty Food Ingredients Limited, and Evonik.